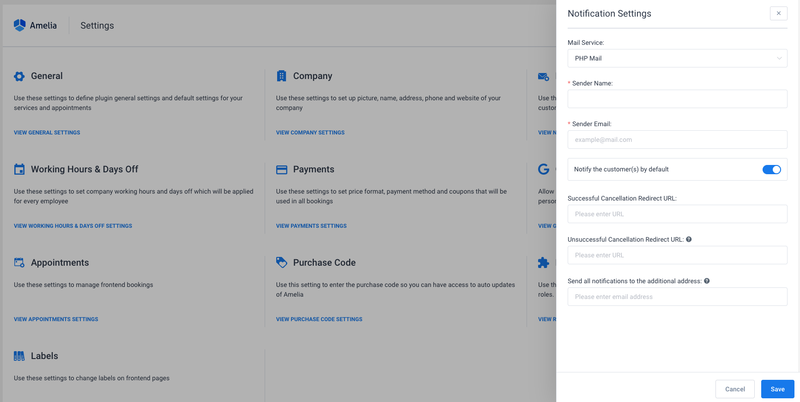 Use these mail settings to notify your customers and employees. PHP Mail (not recommended) – This option is selected by default for users that do not want to configure other mail services. Please note: We strongly recommend changing mail service setting to SMTP or Mailgun because email that is sent with PHP Mail generally gets flagged as spam by mail servers and also can take some time to send. See below how to configure SMTP and Mailgun mail services. WP Mail – This option uses WP mail WordPress function for sending emails, and it is best to use if you use some third-party plugin for sending the notifications. For Gmail, it is also necessary also to turn on the “Allow less secure apps” option in your Gmail account. Mailgun – Powerful APIs that enable you to send, receive, and track emails effortlessly. To set up Mailgun, you need to populate the Mailgun API Key and Mailgun Domain input fields that appear when selecting Mailgun as your mail service. This option’s value will be used as the sender name string in all email notifications that will be sent to your customers and employees. This option’s value will be used as the sender email address in all email notifications that will be sent to your customers and employees. This setting allows you to choose whether “Notify the customer(s)” checkbox in the appointment modal will be enabled or disabled by default. If you disable this option, you will still be able to notify the customers by checking “Notify the customer(s)” checkbox in the edit appointment modal in the admin area. This is where you enter the URL your customers will be redirected to if they successfully cancel the appointment by clicking the cancel URL in the email. This is where you enter the URL your customers will be redirected to if they unsuccessfully cancel the appointment by clicking the cancel URL in the email. This option allows you to set one additional address that would receive all notifications that you have enabled on the Notification page. If, for example, you want admin or manager to receive all emails about appointments, just write the email address here and all email notifications that will be sent to employees and customers, will be sent to this email address as well.